Farberware cookware is considered one of the most popular brands in this price range for many good reasons. This 17 piece, high quality, a stylish and reliable set is part of the Farberware classic series, that can save you lots of time, money and space, thanks to its solid and versatile pieces. Constructed from stainless steel with an aluminium core and suitable for stovetop and oven use, these Farberware pots and pans are able to cook foods evenly, enhancing the flavor of your meals due to their perfectly fitted glass covers. 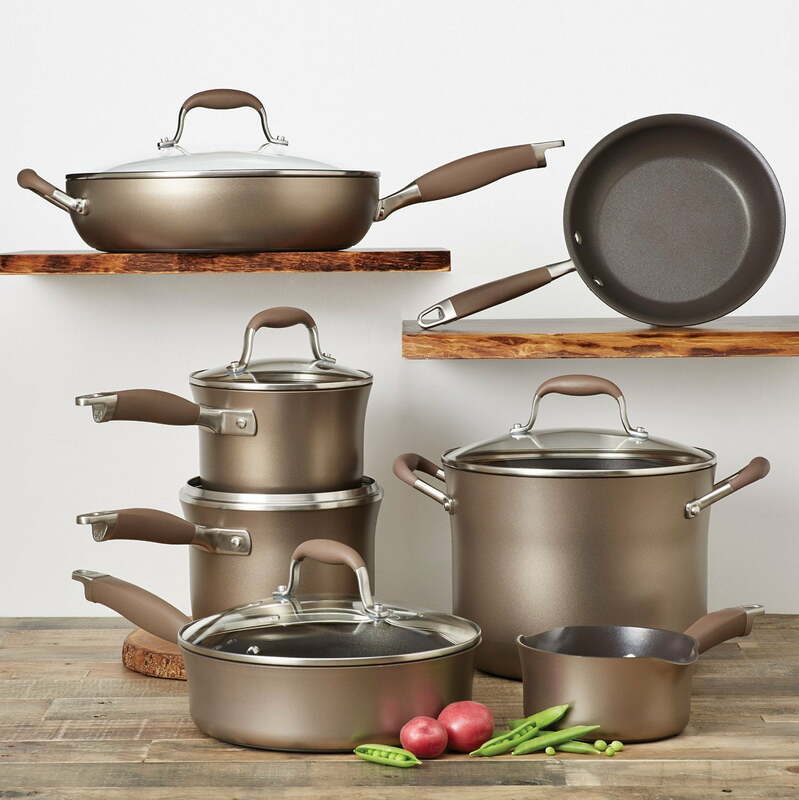 The pans in this Farberware cookware set are made of 18/10 stainless steel, which is one of the most popular materials used for making kitchen cookware due to its resistance to high temperatures and corrosion and its smoothness and natural gleam. The 18/10 feature refers to the percentage of chromium and nickel respectively present in the alloy. But why is it necessary to use two different metals? Isn’t steel durable and resilient enough to provide high-quality cookware? The answer is no. Steel is harder than other metals but it has a low resistance to corrosion and it’s very prone to rusting and pitting. Obviously, these drawbacks aren’t tolerable when it comes to making Farberware pots and this is why these metals are part of the alloy. On the other hand, chromium alone is weaker, so it’s not really the best choice for making durable kitchen tools. But it has the advantage that in combination with steel, it creates a protective layer over the surface of this metal, improving the characteristics of the final material. The percent of chromium in the alloy used for Farberware cookware is 18 (first number in 18/10). Nickel is added to increase the effectiveness of the protective layers in order to prevent rusting and stains. Also, this element is responsible for one of the most appreciated characteristics listed in Farberware cookware reviews, which is the bright and attractive shine of the items. The percent of nickel used in the final alloy is 10 (the second number in 18/10), but this may vary from one manufacturer to another. 18/8 stainless steel is also used in cookware manufacturing. Besides stainless steel, these pots and pans include a thick aluminium core, which warms up and transfers heat rapidly and uniformly, which will prevent foods from being burned or remaining uncooked. As for the handles of these pans, they’re made of black phenolic, which is a very viscous synthetic resin a form of rubber, stable and resistant to temperatures up to 370 degrees F. This material is preferred by many cookware brands as it is more affordable and easier to process when compared to steel. The handles are very functional and easy to grasp due to their practical shape, they are non slip and make the pots easy to handle and very appealing. Without any doubt, this is one of the most complete cooking sets on the market. Including 6 different types of pots and pans, this set almost eliminates the need of purchasing additional cookware, as it provides the right items for virtually any cooking task. The lids are interchangeable and have a solid seal. Except for the covers of the storage bowls, all other lids are made of thermo-resistant glass, so they can be safely used in the oven. The glass covers allow you to watch your foods cook without having to lift the lids so you can forget about moisture and nutrients escaping. The high versatility of this stainless steel Farberware cookware set is given by the different shapes and sizes of the pots and pans. 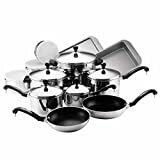 Whether you need to boil a small quantity of soup, fry chicken, simmer meatballs or prepare a delicious sauce for fish fillets, you will certainly find the ideal item among the cookware included in this set. Given the fact that all the pieces are suitable for both stove top and oven use and that they don’t warp under high heat, you will no longer have to use additional thermo-resistant dishes for baking delicious cookies. These Farberware pots are light weight and have a practical design with thick, rolled pan rims for extra durability and enhanced drip-free pouring. Suitable for solid plate, ceramic, gas, radiant ring, halogen and induction stoves, this is definitely one of the most versatile cookware sets on the market. 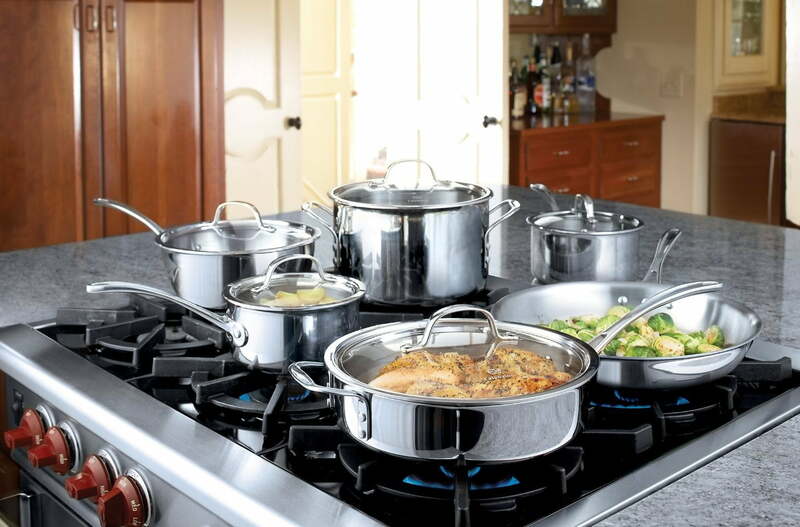 Due to the materials they are constructed from, these Farberware pots and pans are oven-safe up to 350 degrees F, which is really an advantage as you will not have to transfer the partially cooked meals from one dish to another when moving them from the stove into the oven. All the pieces in this set are dishwasher safe, this being a really valuable feature for large families where preparing the meals already takes enough time. However, not having a dishwasher shouldn’t be a reason for concern as according to Farberware reviews the pots clean up very easily and can be perfectly maintained through manual washing as well. Both stainless steel and phenolic are resistant to chemicals in dish soap but for protecting the pans from scratches, stains and water spots, you should avoid chlorine bleach and ammonia-based cleaners. Instead, you can add a few drops of citrus juice or vinegar into the hot soapy washing water. Non-abrasive cleaners like Bar Keepers Friend are also great for general cleaning and maintaining the cookwares shine. Part of the Farberware classic series, this 17-pieces cookware set is ideal for large families where frequent meals are cooked. Very economical and providing all theutensils for baking, roasting, frying, boiling, simmering or steaming foods, this is definitely a multi-use cooking set. Coming with a lifetime warranty, this classic Farberware cookware set really can’t be beaten for the price, so there’s no surprise it is rated 5 stars by 40 out of 50 reviewers. One of the best features of these Farberware pots is the minimal amount of storage space they require. Being conveniently sized, these pans nest inside one another, saving a lot of space so they’re ideal for fully equipping small kitchens. A second benefit highlighted by reviewers refers to the optimal cooking these pans provide. Due to the materials they’re made of – a combination of stainless-steel and fully capped aluminium – these cookware items are able to distribute heat evenly, to eliminate hot spots and cook the foods completely. Also, the internal surfaces stay flat even at very high temperatures, so you won’t have to worry about burning the meat or the pancakes. One of the few negative aspects mentioned in Farberware cookware reviews refers to the slightly lower temperature up to which these pots and pans are oven-safe (350 degrees F compared to 500 degrees F for other brands). But this isn’t necessarily a drawback as you can always start the cooking process on the stovetop and then simply transfer the pot into the oven if you’re not pleased with the consistency of the prepared food and want to cook it a little longer. Another drawback about this Farberware cookware set is that the glass lids have knobs instead of loop handles so they provide a less comfortable grasp compared to other models. However, this is a minor detail as all the knobs are made of stay-cool phenolic, so you can handle the covers with your fingers without getting burned.